Death isn’t glorious in Outward, so don’t let it happen to you. If you haven’t heard yet, Outward is hard. I’ve found myself limping away bloody from fights with basic enemies like hyenas that in any other RPG I’d have stomped under my boot during a tutorial. Based on the chatter online, I don't think I've died quite as many times as most people, and I’m feeling generous so I’ll send you off with the pro-level skills that have kept me alive even when surrounded by three bandits. The secret is: be a coward. Not an average craven who runs from fights when they realize that they’re in over their head, but a truly masterful coward so afraid of direct conflict that you plan the death of your assailants before they even spot you. Keep your friends close and your enemies closer, as I’m seldom known to say until now. Spare an eye for everything nearby that’s likely to kill you, because chances are they might like to kill each other instead! Results can be mixed, but I’ve had decent luck sprinting away from various aggressive wildlife and leading them into the open arms of a bandit duo. Make sure to observe the outcome from a safe distance so the winner doesn’t immediately turn their murderous attentions back to you. If it was a close fight and the winner is looking ragged, by all means step in to deliver the killing blow. Traps are relentless in Outward, often peppering the ground leading up to enticing chests or dark tunnels. You can use them to your advantage in the same way. Relentlessly. Tripwire traps are easy to set up with no prerequisite skills. That may seem like a safety hazard but... I guess that’s the point. After your trap is built on the ground, any number of sharp objects can be put inside as offensive material. Metal and wooden spikes (which can be crafted or found in supply caches in the wild), spare weapons, or predator bones looted from the corpses of hyenas that you had bandits kill for you. You can even stick a fishing harpoon into a trap. Repeat ad infinitum. You won't set off your own traps (nor will your co-op friends) so feel free to be an absolute scumbag and sprint backwards through a hell of your own design with an enemy hot on your tail. It’s hard to miss the icon that pops up every time you dodge roll while wearing your backpack. Outward clues you in early that this is a suggestion to shrug the weight off your shoulders while fighting, but it’s still easy to forget this maneuver in the midst of a fight. If you’re going to drop your stash mid-tussle, make sure you’ve organized your inventory appropriately and are keeping items you need in your pockets, not your backpack. I feel like an idiot after freeing myself of that weight, circling my enemy, and realizing that the fire stone I need to cast more powerful spells is stuffed in the bottom of the backpack that’s now being guarded by my enemies. Don’t lose a fight without your backpack on, though. If you lose all your health while wearing it, chances are good you’ll wake up with your pack lying nearby. But if you’re taken down while your pack is off, you’ll have to run all the way back to that spot to retrieve it. If you’ve taken a chunk of damage, lay down to restore your health and stamina. Don’t be afraid to sleep outside, even at night or in the snow. Split your time wisely in the sleeping menu between resting and keeping guard and you’ll have no trouble with ambushes. The extra time spent guarding to ensure your safety can cost you extra thirst and hunger, but rarely to such a degree that drinking and eating before lying down can’t prevent disaster. There’s also a camouflaged tent for sale in Berg that reduces the likelihood of being ambushed. And watch for clusters of butterflies floating around in the open wilderness. Their usefulness isn’t immediately obvious but if you throw down a tent or bedroll in their midst, you’ll find yourself in a safe zone with no chance of being ambushed while sleeping. When being a coward, it’s important to dress the part. If you’ll be lugging around all those recommended traps and metal spikes, you’ll need plenty of inventory space. Larger backpacks are worth the investment and if you’re feeling a little scummy you can take advantage of a cheat to earn a 110 capacity backpack in the bandit camp nearest to Cierzo. As for armor, you’ll want to stock up on pieces that give you a boost to movement speed so you can go fast. In the opposite direction of danger. 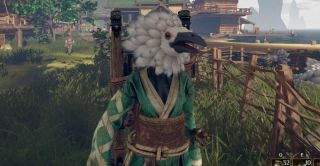 The Pearlbird Mask, a rare loot drop from dead pearlbirds, adds 20% movement speed. The Master Trader Boots and Garb add a total of 20% movement speed together. Just this once, I prefer function over fashion.